Heavy-duty sewer cleaners from Haaker Equipment Company make short work of the daunting task of cleaning the sewers of many cities and towns. Industrial facilities and commercial establishments also make use of Vactor sewer cleaners to solve many of their clogging problems. These cleaners are integrated with the “Smart Truck” features, requiring less manpower because of their automated systems. A Vactor truck with a mounted jetter and rodder is easily operated by one person. Haaker offers Vactor’s 2100i line of heavy-duty sewer cleaners for utility services for fast and efficient cleaning. For years, the 2100 series has been one of the most trusted models of sewer cleaners in service with a number of utility companies all over the country. Haaker provides two variants of the 2100i series—positive displacement (PD) and fan-and-air routing system—as well as Vactor truck parts and sewer cleaning truck equipment for these systems. 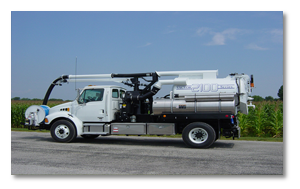 Rapid response is the key selling point for the Vactor 2103, which is in service with some local utility services. It’s a smaller version of the 2100 series but just as effective in removing waste water and debris from sewers, especially in case of an emergency. This model is ideal for performing repairs and maintenance to storm water lines but at a much lower cost. The 2103 model is equipped with a PD vacuum, along with an increased inlet volume and the option of a JetRodder Pump. Haaker Equipment Company is proud to serve areas within California and Nevada, as well as the city of Phoenix, Arizona. To learn more about the products we offer or to request a price quote, please do not hesitate to send us a message through our Contact page.